As sub consultants to Farrell Consulting Group, L.S. 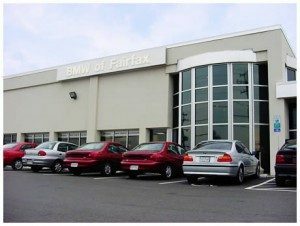 Grim Consulting Engineers was responsible for all mechanical, electrical, and plumbing issues associated with the design of a new service facility for the BMW franchise in Fairfax, Virginia. The project involved the adaptive reuse of an existing structure adjacent to the Fairfax BMW facility. The structure has been converted to a service support building, which are two stories and approximately 6,000 square feet per floor. Within this building, it houses the service drive-up bay, where a customer drives into a heated and lighted bay and describes the repair to the service consultant -who will then drive the car to the adjacent garage building for repair while the customer waits in the lounge. The lounge consists of a state of the art waiting facility, which markets the latest in BMW products. Also housed within the facility is the service billing offices, as well as, the parts offices for the dealership. L.S. Grim Consulting Engineers was responsible for all mechanical, electrical, and plumbing issues associated with the work.